Fresh or dried apricots are a naturally sweet-tasting fruit. They are rich in beta-carotene, giving them that beautiful orange hue. Apricots can be eaten whole, dried, canned, or as preserves. While they are relatively high in sugar, you can enjoy their nutritional benefits if you keep your portion to one serving and to avoid eating foods made with apricot preserves or added sugar. One small apricot contains about 17 calories, raw or dried. 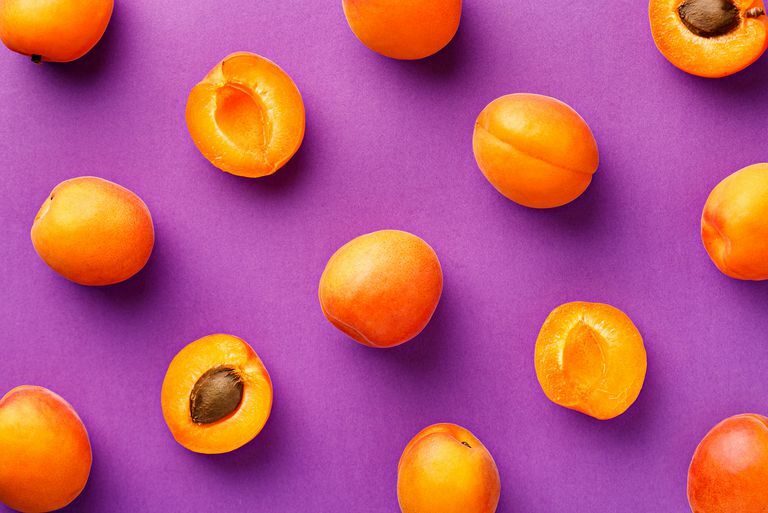 One serving of fruit is about 60 calories and 15 grams of carbohydrate, therefore a regular serving of apricots is about three to four apricots. Apricots contain about 3 grams of fiber per serving, making them a good source of natural fiber. Apricots also contain a considerable amount of sugar in a small serving, especially if you are monitoring your carbohydrate intake. When eating, aim to stick to one serving, and if you are particularly hungry, consider opting for fresh, as opposed to dried. Fresh apricots take longer to eat and provided more volume than their dried counterpart. The glycemic index of apricots is about 31, which is low to moderate on a scale where pure glucose is 100. The glycemic load of a food takes into account both the glycemic index and the amount of food eaten. A glycemic load of 10 or less is considered to be low and should have little effect on blood glucose or insulin response. The glycemic load of one dried apricot is 1, 1 ounce of dried apricots is 9, while 1/2 cup is 20. Apricots have only a trace of fat, most of which is monounsaturated. A raw apricot has 27 milligrams of omega-6 fatty acids. A single apricot has only a small amount of protein that would equal only 1 percent of your daily needs. For a balanced diet, you would need also to eat higher protein foods such as legumes, nuts, dairy, fish, and meat. Apricots are a good source of vitamin A and vitamin C. Vitamin A is an important fat-soluble vitamin that has many roles, one of which is maintaining eye health. Vitamin C, a water-soluble vitamin, aids in keeping your immunity boosted and is an important nutrient involved in wound healing. Dried apricots lose almost all of their vitamin C, and some other nutrients, in the drying process, but retain their vitamin A and potassium. Apricots contain phytonutrients, including antioxidants such as polyphenols, flavonoids, and beta-carotene. These may protect your cells from damage. Apricots contain soluble fiber that can help control blood cholesterol levels and insoluble fiber that contributes to digestive health. The "nectar of the gods" enjoyed by Greek and Roman deities is believed to refer to the juice and pulp of fresh apricots. Are dried apricots high in sugar? If you've been told to avoid apricots because they are rich in sugar, there is some validity to this. Apricots, especially dried, contain about 2 grams of sugar in one small piece. It can be easy to overeat dried fruit; therefore, if you are someone who is trying to watch your carbohydrate intake or if you have diabetes, avoiding dried fruit is probably a good idea. How do you eat an apricot? Apricots can be eaten whole, skin and all. The only time you may want to remove the skin is if you are using apricots to make baked goods, as the skin can change the texture and appearance. It is important to remove the stone (pit) as it is not edible. The kernel inside the shell of the pit contains the poisonous compound amygdalin and can cause cyanide poisoning. Drugs made from apricot pits were once marketed as an alternative cancer treatment. Apricots can be purchased fresh, dried, canned, and in jams, spreads, and preserves. Typically, you will find fresh apricots in grocery stores in the United States because apricots are in late spring and summer. Choose fresh apricots that have a rich, orange uniform color. Avoid fruit that is pale or has any yellow on it, as it is not yet ripe. Fruit should be slightly soft, but firm to the touch. Avoid fruit that is overly firm, as it is not yet ripened. Dried apricots can be purchased in the grocery store next to other dried fruit, such as raisins and cranberries. When purchasing dried apricots, purchase those that are unsweetened. Added sugar will only pack on unnecessary calories and carbohydrates. If you are buying canned apricots, purchase those that have no sugar added and are in their own juice. Most jams and spreads contain a lot of sugar per serving, but a small amount can be used to sweeten recipes. If you are buying preserves you can save on sugar by purchasing those with no sugar added. Apricots can be eaten simply whole, by themselves, as a snack. They can be chopped up and added to yogurt, cottage cheese, hot cereal, or baked goods. A few dried apricots pair well with a handful of nuts for a filling, fibrous post-workout or midday snack for an energy boost. Apricots can also be used in dessert recipes, fruit spreads, and sauces. Apricot preserves can be used as glazes for meats. Apricot food allergies are rare. However, if you have hay fever you may have a pollen-allergy food syndrome and cross-react to proteins in apricots that are similar to the pollen. If you are allergic to birch, you experience this reaction when you eat apricots or even have a liqueur such as amaretto that may be flavored with apricot pits. You might feel a tingling or itch in your mouth after eating apricots. In rare cases, this can be more serious and trigger throat swelling or anaphylaxis. You may also experience an apricot allergy if you are allergic to related fruits in the Rosaceae family, especially peaches, cherries, apples, and almonds. People who are sensitive to sulfites should use caution with commercially dried apricots as they may be treated with sulfur-containing compounds during processing. Sinha M, Singh RP, Kushwaha GS, et al. Current Overview of Allergens of Plant Pathogenesis Related Protein Families. The Scientific World Journal. 2014;2014:543195. doi:10.1155/2014/543195. USDA National Nutrient Database for Reference USDA. https://ndb.nal.usda.gov/ndb/search/list. How Many Calories Do Peas Have? Are Cucumbers Mostly Made of Water?